Rat Hindbrain Neurons (RHbN) are derived from hindbrains of normal embryonic rat (gestation day 15) by standardized methods. When cultured under the recommended conditions, RHbN arborize and form complex neurite network in one week. RHbN Stain positive for β III-Tubulin. RHbN are available in multiple formats, including cryopreserved neurons, freshly isolated primary neurons in suspension, or pre-plated cultured neurons. The hindbrain includes the cerebellum, the pons, and the medulla. These parts together control and support various vital bodily processes such as breathing, swallowing, blood circulation, muscle tone, sleep and arousal patterns, coordination, equilibrium maintenance, and more. Malformation, vascular disorders, atrophies, and traumas at hindbrain strike its proper structure and functions, leading to the manifestation of a variety of clinical features of different severity. Studying hindbrain neurons in those disease conditions will allow a better understanding of the disease mechanisms, physiopathologies, and advancement in drug development and therapies. Cultures of hindbrain neurons can be applied for a variety of experiments including toxicity test, immunostaining, live cell imaging, co-culturing, electrophysiology, and more. 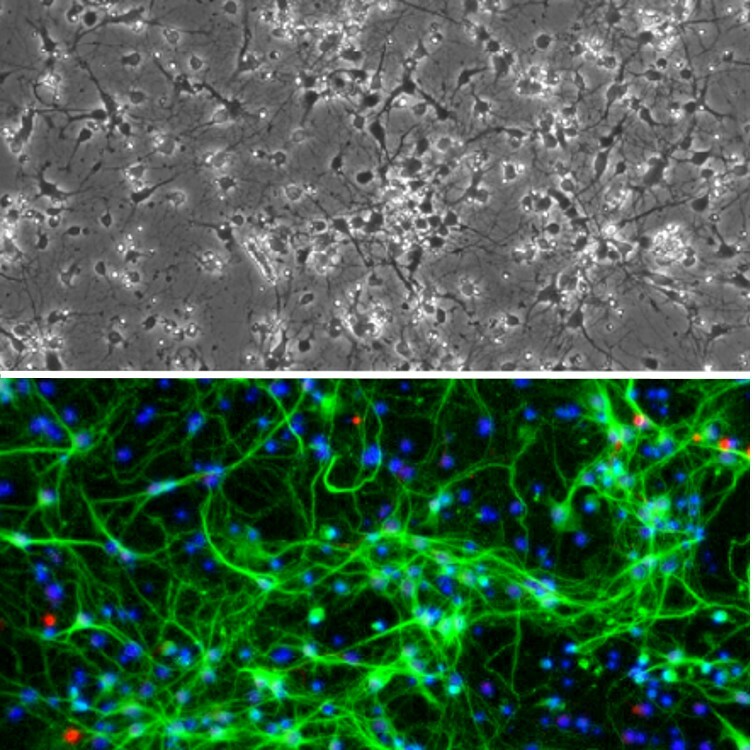 (Click to Enlarge) Cryopreserved Rat Hindbrain Neurons (RHbN) revived and cultured for 8 days (top), stained (bottom) for β III-Tubulin (green), GFAP (red), and DAPI (blue).